Two walks I will never forget! 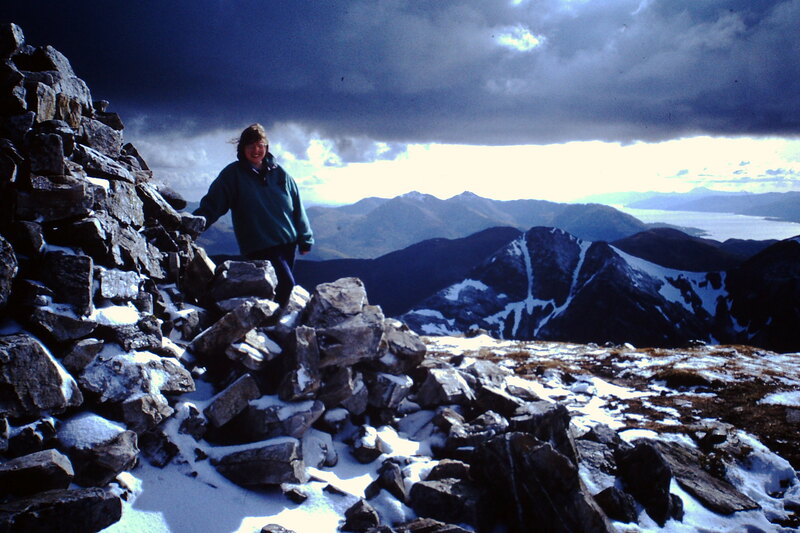 The first one was Sgurr a'Mhaim with my wife, due to knee problems it was the last Munro she ever climbed - over 20 years ago now! 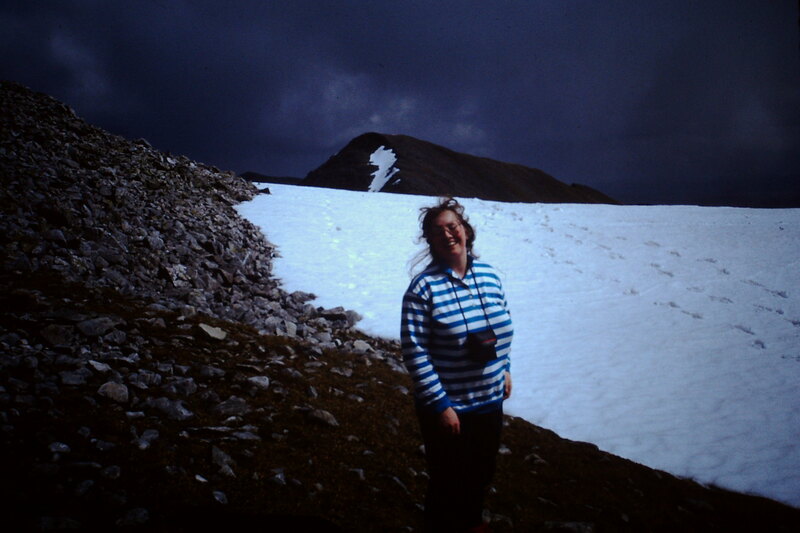 But it was good that her last ever Munro was, literally, amazing - the summit view was perhaps the most memorable I have ever seen in the UK, due to unusual conditions as the photos will show. 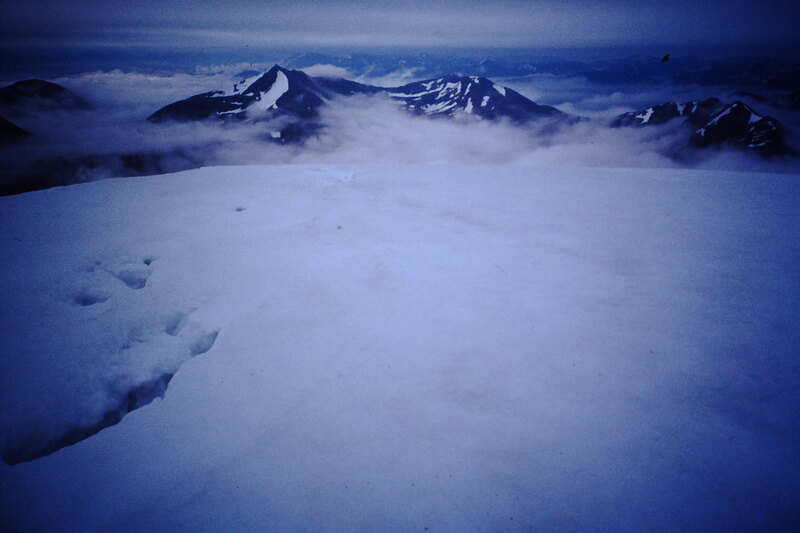 I did the second walk solo the following day. 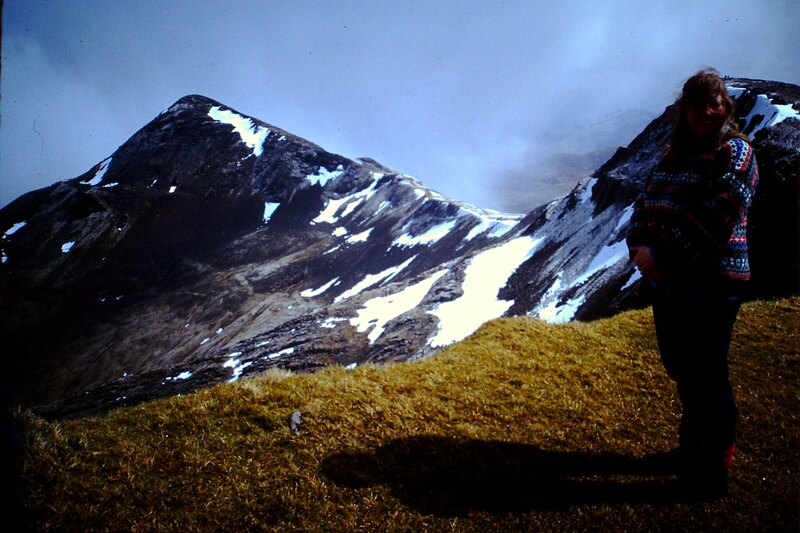 It looked like an obvious circuit , on the map, of the 4 highest peaks in western Scotland, But strangely there was no guidebook information available about it at the time. We are talking pre-Internet era! 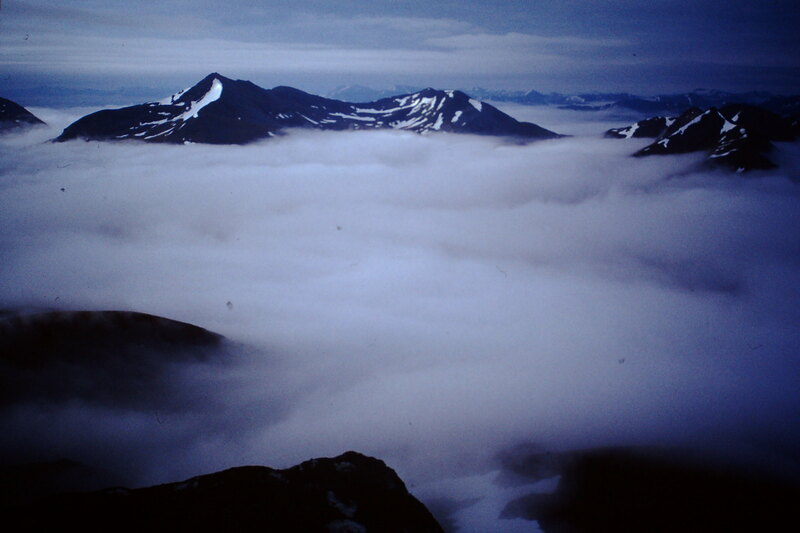 Again, I was very lucky, with cloud inversions adding to some sensational views. Both walks are on a set of slides found in my loft and converted to digital thanks to my £39.99 device from Aldi! (see also my Bolivia TR). 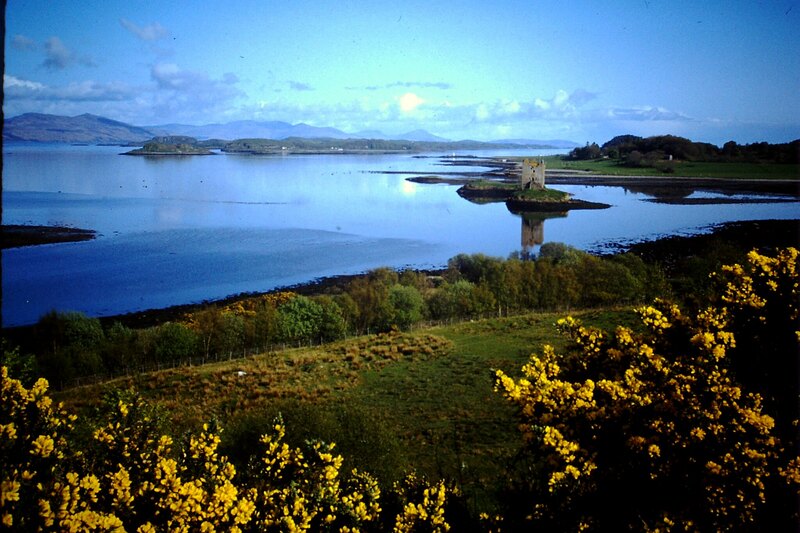 We were staying at Port Appin so I will kick off with a photo of Castle Stalker. Setting of Monty Python's Holy Grail? We parked at Achriabhach and our first stop was of course to look at the Polldubh falls and the view up Glen Nevis to Meall Cumhann. 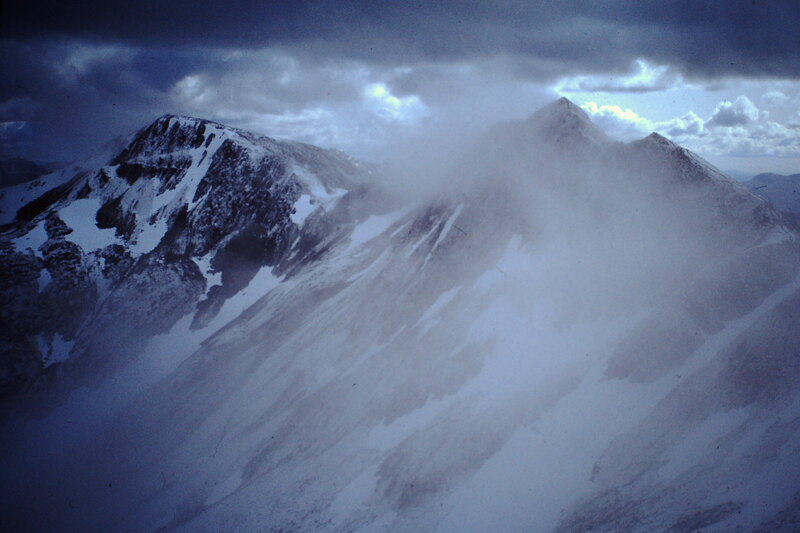 Stob Ban was a brooding sight as we set off up the valley of the Allt Coire a'Mhusgain. 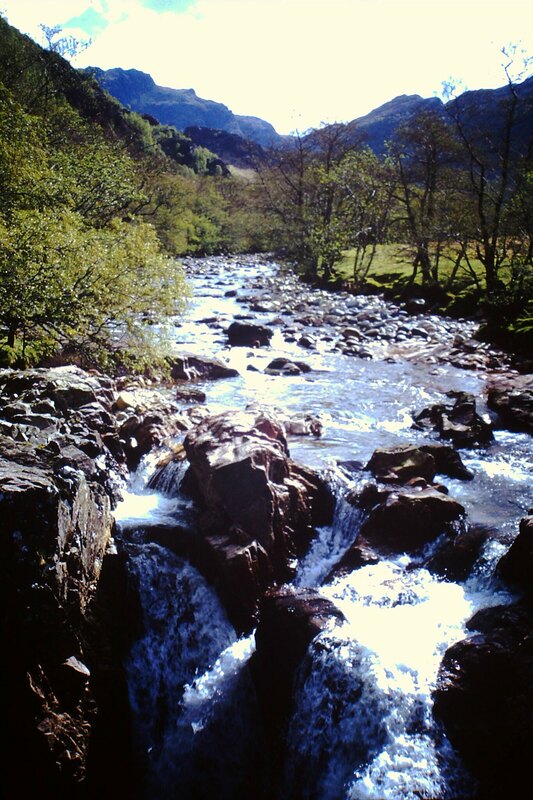 The Allt has some fine waterfalls itself. Here is a rare photo of me (Parental Advisory: wearing 90s shorts) thinking about trying to get a closer look at them. For those who know me: note the beard that I had in 1993. When it comes to hipster cool zeitgeist, I'm about 23 years ahead of Shoreditch. 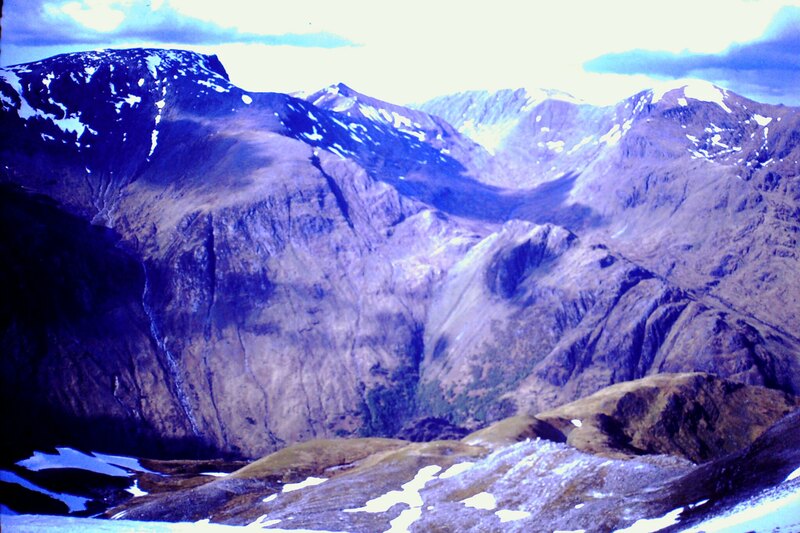 Closer view of Stob Ban as we walked up the valley. 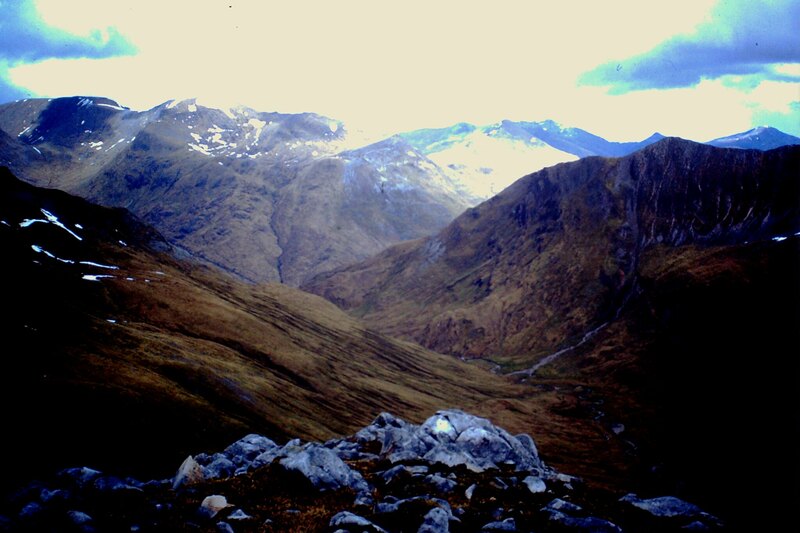 Looking back down, we could see down the lower half of Glen Nevis (the bit below the "elbow") towards Fort William. 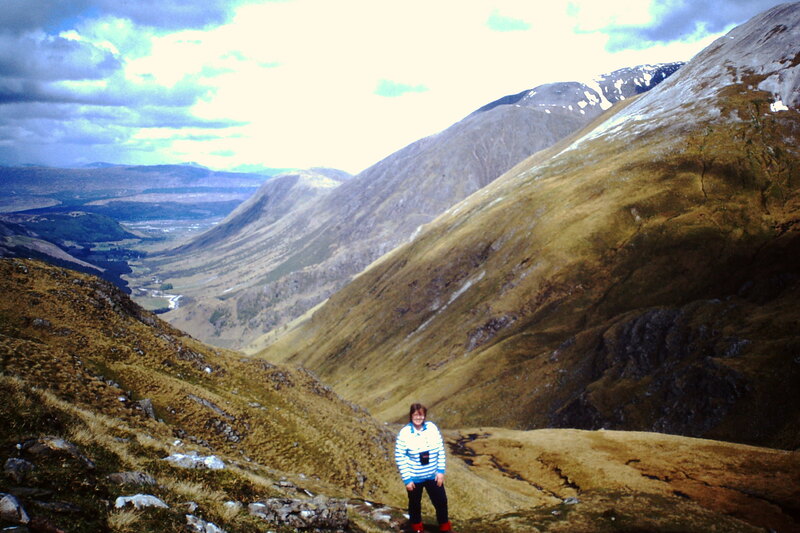 This was a great route for appreciating the massiveness of Ben Nevis's western and southern slopes. 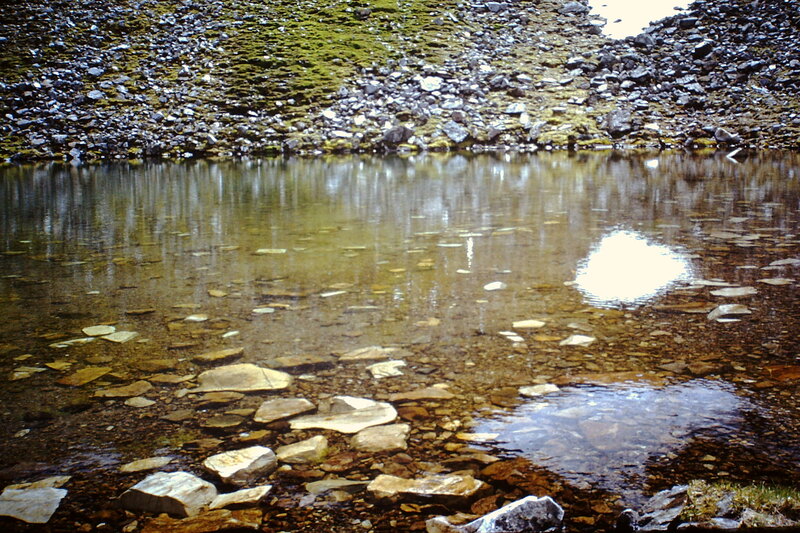 We soon arrived at the magical little pond of Lochan Coire nam Miseach. This tranquil pool is one of my favourite spots anywhere in the world. The water was like glass. We couldn't linger too long though, we had to head on upwards - here we are near the top of Sgurr an Iubhair, with Am Bodach starting to peep into the view. 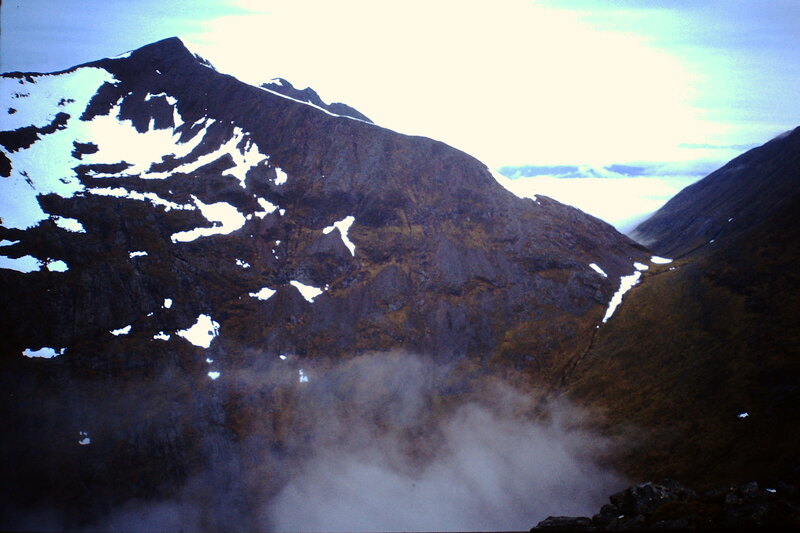 And here's a view from the top of Iubhair looking down the ridge of Stob Coire na h-Eirghe, with Bidean nam Bian and his extended family massed together on the southern horizon, above the shadowed corrie on the north side of the Aonach Eagach. 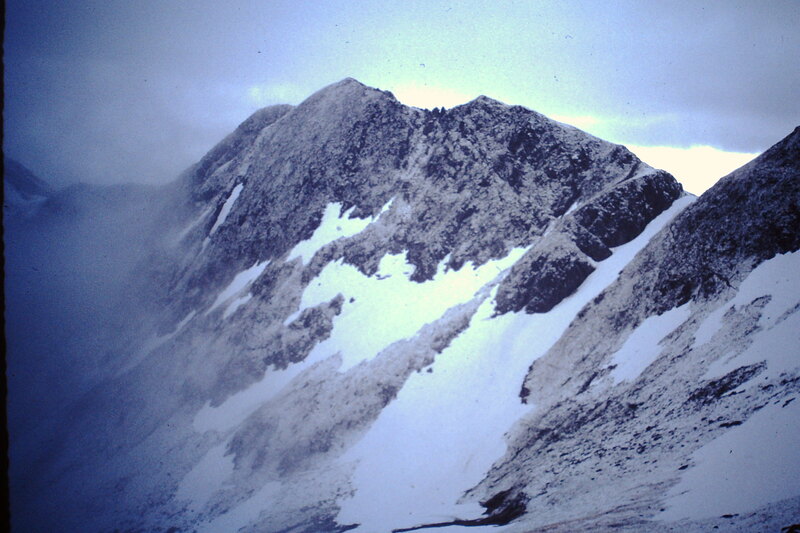 To the right of the Bidean group is Sgor na h-Ulaidh wih its distinctive summit "bobble" just about visible, and Beinn Fhionnlaidh to its right. 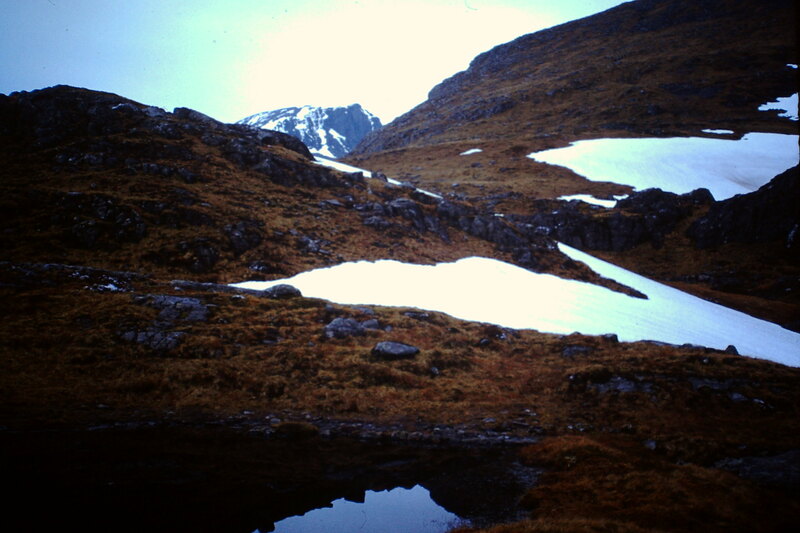 A shame these photos don't have anything like the resolution of the original slides! 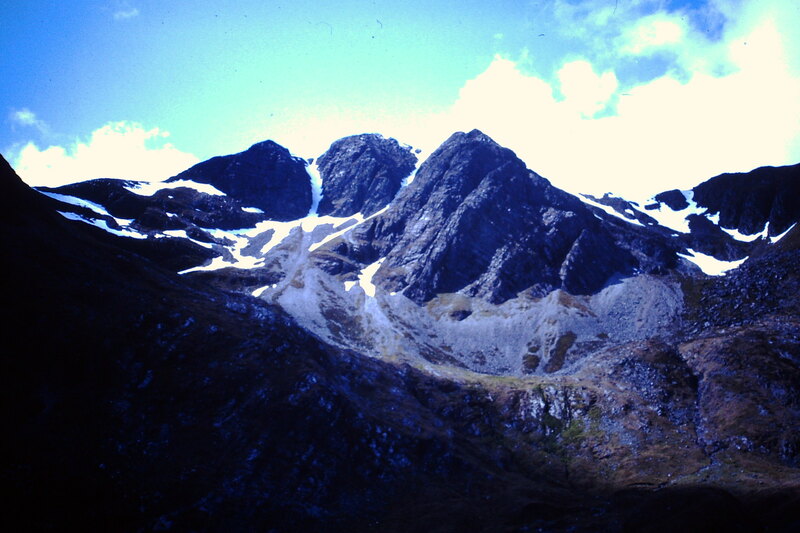 The bulky hill below the skline east of Aonach Eagach is of course Garbh Bheinn above Loch Leven. 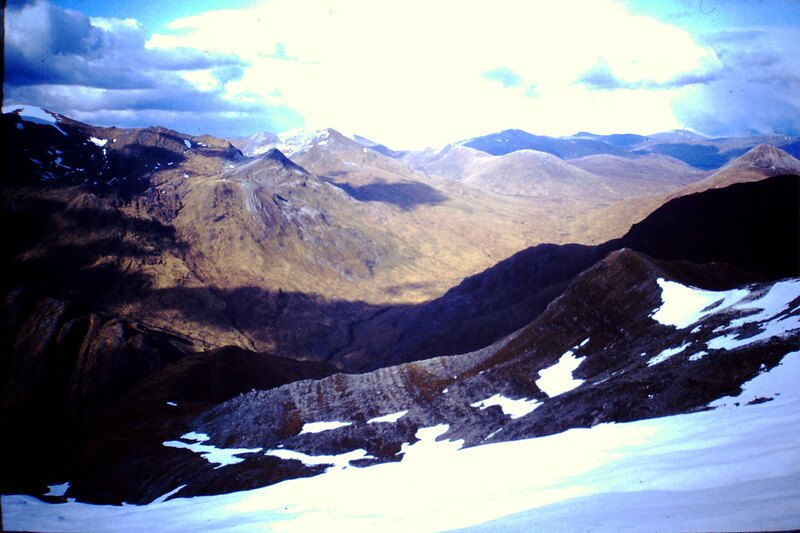 Here's the eastern view from Iubhair showing the snaking Mamore ridge from Am Bodach, onwards to Stob Coire a'Chairn, the twin peaks of Na Gruagaichean, and the distant Binnean Mor. And, to the left of that view was the deep Coire a'Mhail backed by An Gearanach, with a skyline of the Aonachs and the Grey Corries. 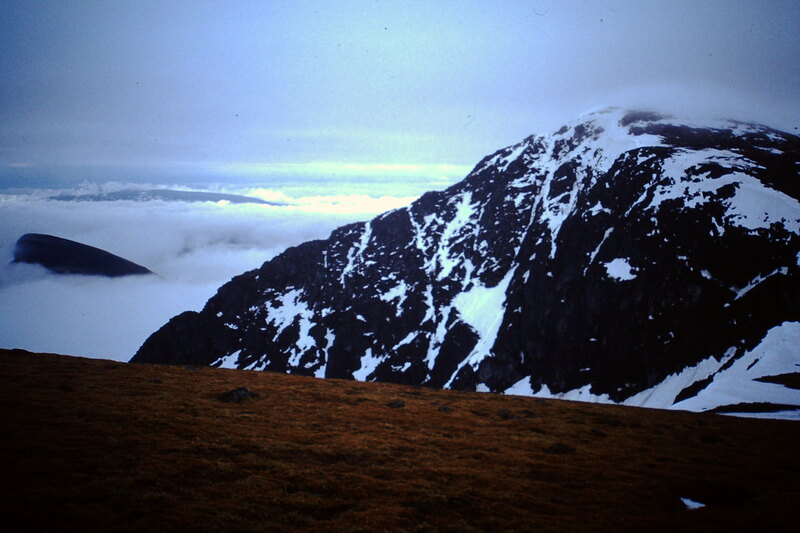 The weather was starting to look quite brooding now - this photo is a view of our planned onward route over the Devil's Ridge to Sgurr a'Mhaim, with cloud hitting the summit of the Ben in the background. From here I made a careful mental note of the blunt ridge dropping down from the Aonachs to the bealach below Carn Mor Dearg, which I would be using the next day. 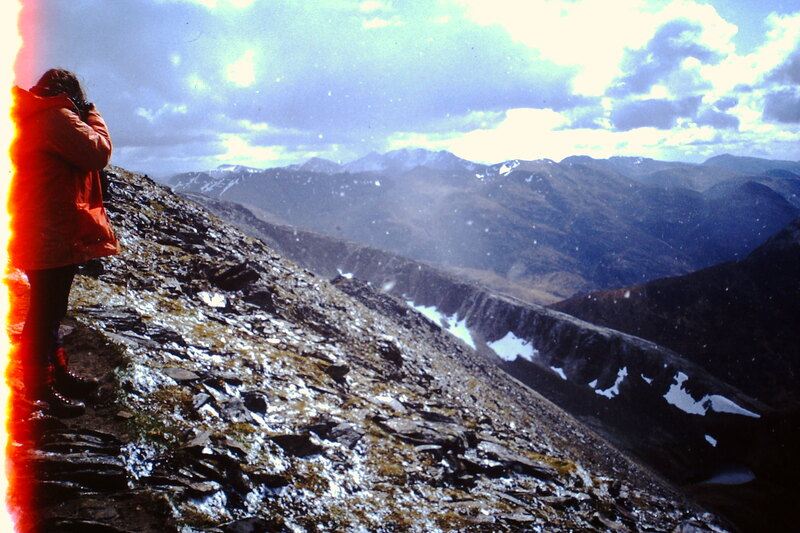 The first snow shower hit us as we descended towards the dip between Iubhair and Stob Choire a'Mhail. In this digital age - Note for younger readers: the red left edge of the photo is not the end of the world coming, it's just the end of the roll of film. However, the shower was very brief and by the time we got to the 924m col, the shower had gone and the sun shone again over this view back to the Am Bodach and Sgurr an Iubhair. 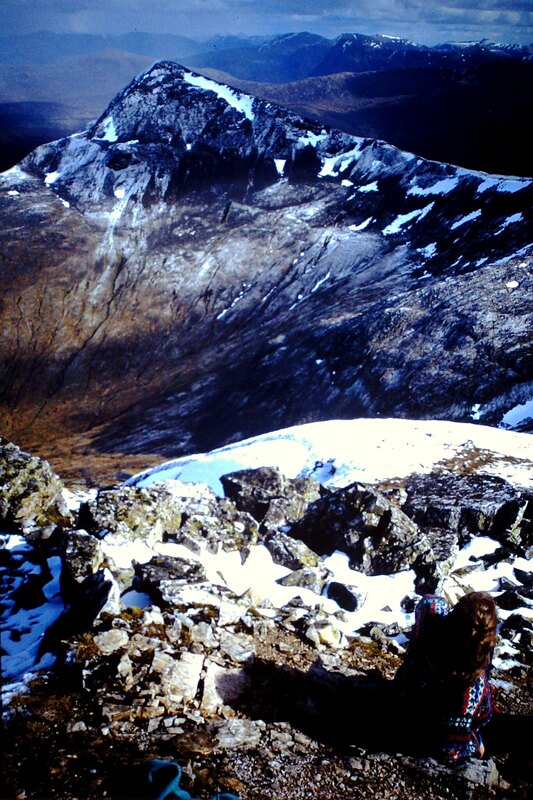 We went on up to the top of Stob Choire a'Mhail but my wife did not like the look of the descent to the dip. Also it was clear that a much bigger squall was coming in off Loch Linnhe. 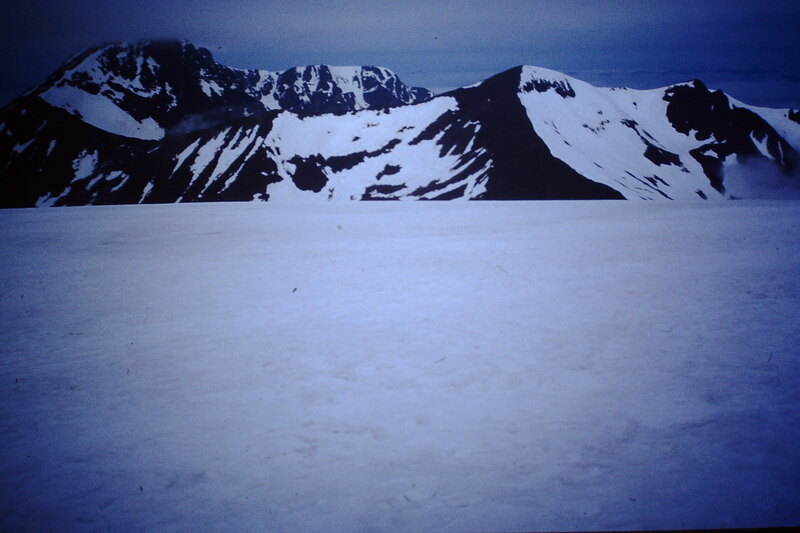 So we retraced our steps back to the 924m col. 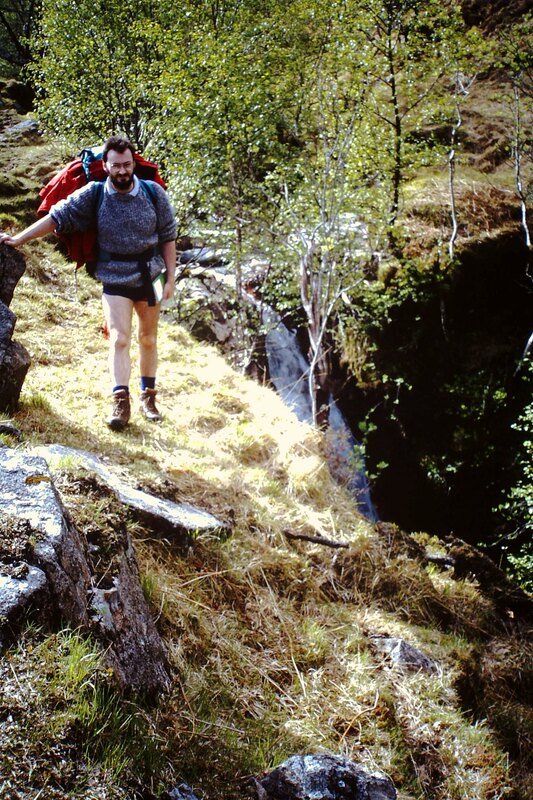 I had noticed a little path descending into Coire a'Mhail and wondered if this might allow us to bypass the tricky bit. 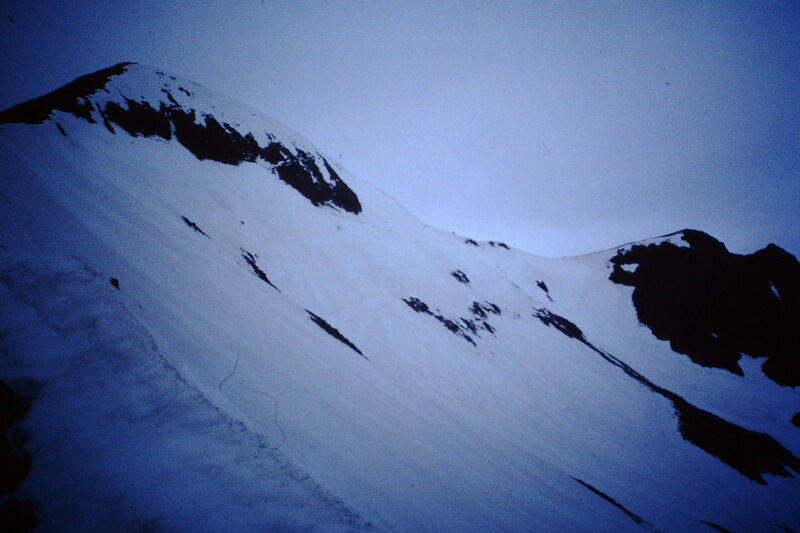 At that point the snow came down, but the path seemed OK, descending a bit and then contouring below the Devil's Ridge. Once we were onto the steep flanks of Sgurr a'Mhaim itself, we stopped and took in the grandstand views of the shower clearing from Stob Choire a'Mhail and Sgurr an Iubhair. These photos were taken at intervals of only a few minutes each. 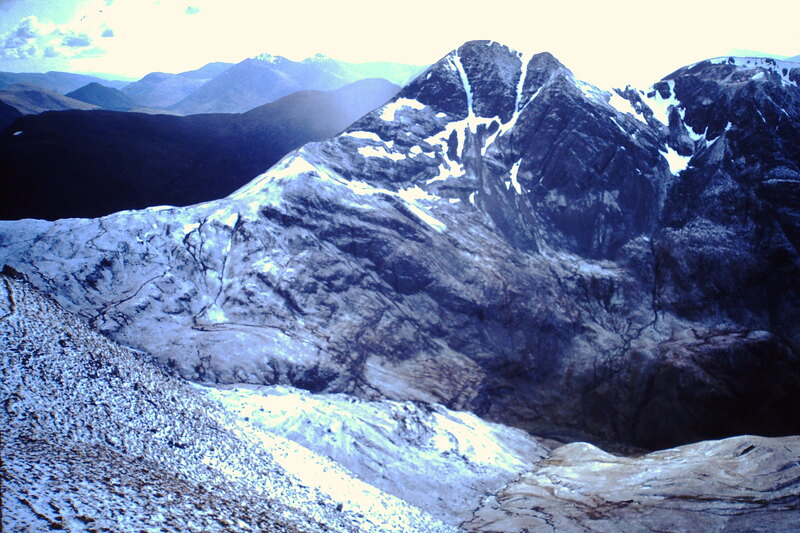 This one below, of the snow gradually shading out over Stob Ban is my favourite, I think I will see if Jessops or someone can do it at full quality sometime. In the distance are, of course, Beinn a'Bheithir's peaks - Fraochaidh on the left, then Sgorr Bhan with Sgorr Dearg above it, and Sgurr Dhonuill to their right. 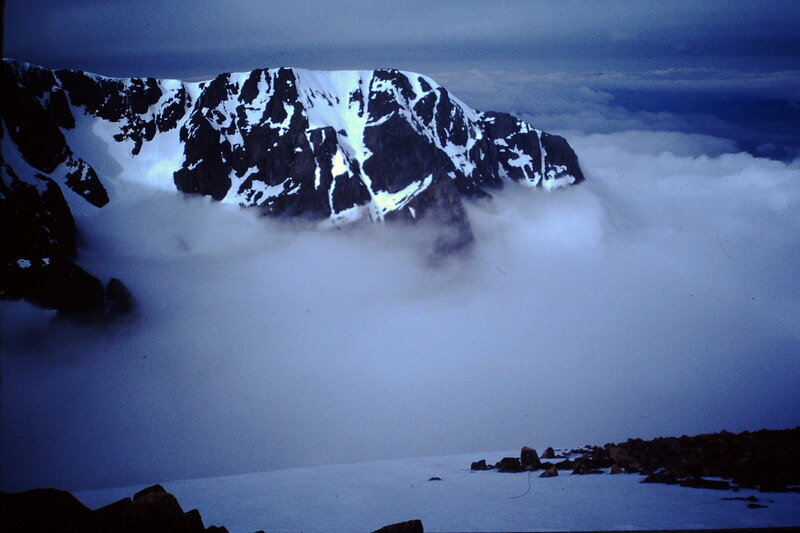 All that remained was the final few steps up to the summit. But one last look back at the snow-dusted ridge... and, in the distance, Ben Cruachan and especially the Taynuilt Peak can be made out just to the right of the Bidean group. 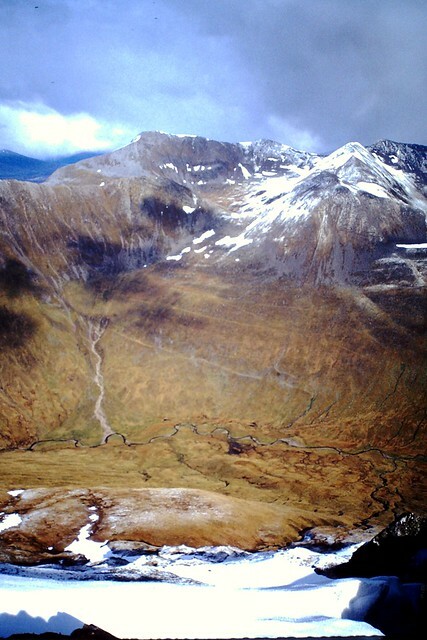 Right of Sgor na h-Ulaidh are Beinn Fhionnlaidh and Beinn Sgulaird. And then the summit cairn! The views in all directions were stunning: new snow cover here and there and spectacular, theatrical light filtering through the receding snow clouds. 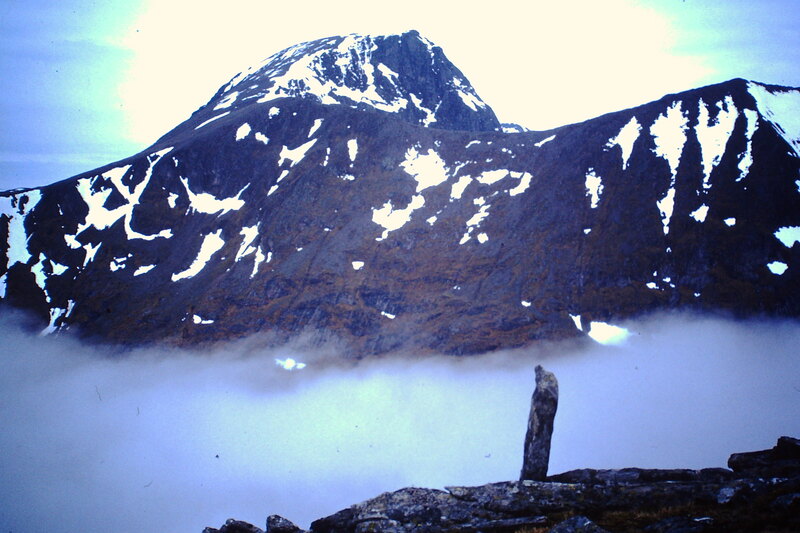 In the top right of the cairn photo above, Mull and Ben More stand out beyond Loch Linnhe. 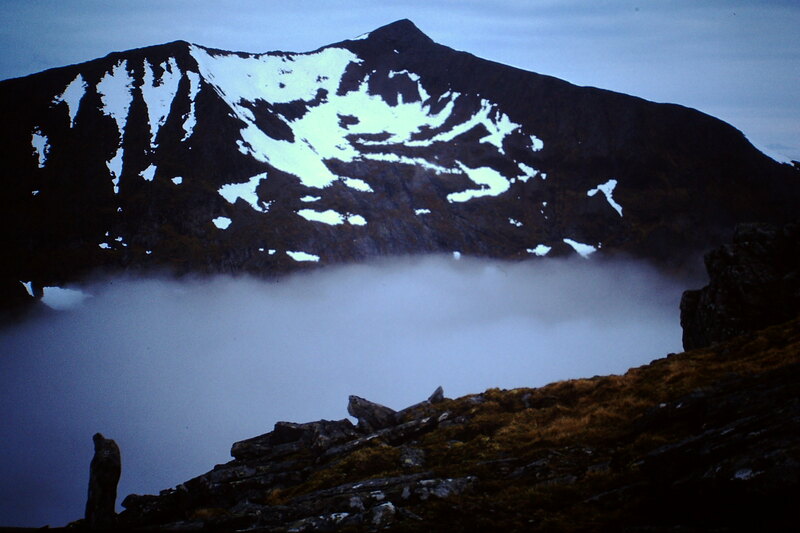 Below is the view over to Am Bodach. 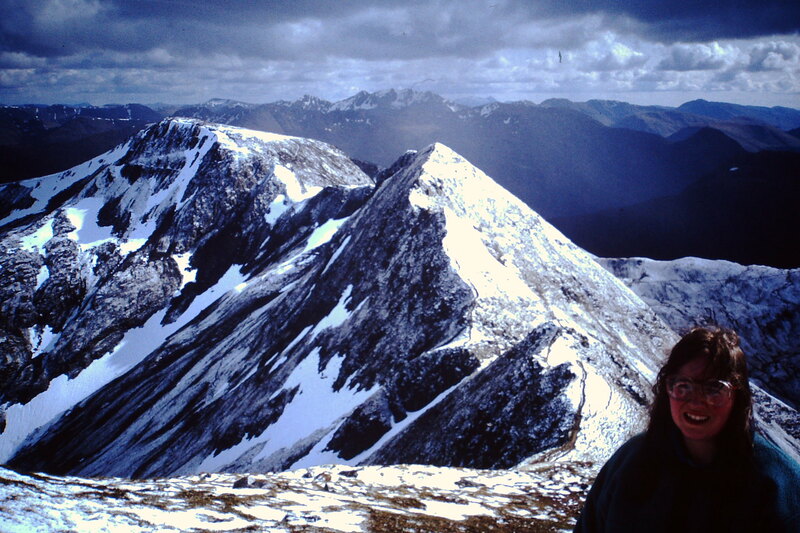 The dark scarped hill above and to the right of it is Stob Dearg, with the Balckmount summits about it - from left to right I think these are Meall a Bhuiridh, Creise immediately behind Stob Dearg, then Clach Leathad and Stob Ghabhar over on the right. To the left of Meall a Bhuiridh are I guess the various summits east of Bridge of Orchy that divide Glen Lyon from Rannoch Moor. There is even a very dim glimpse of a faraway high, pointed peak that might be Ben More of Stob Binnean. 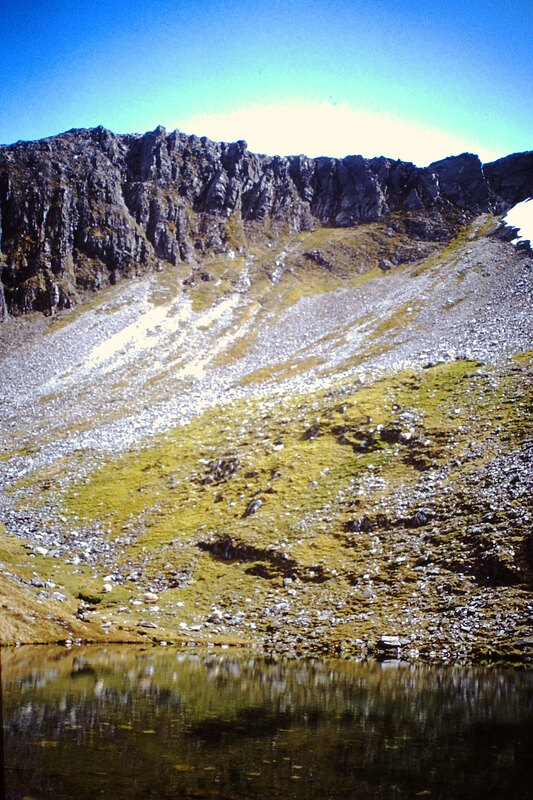 Coire a'Mhail, with some stange lines across the hillside (stalkers' paths?) 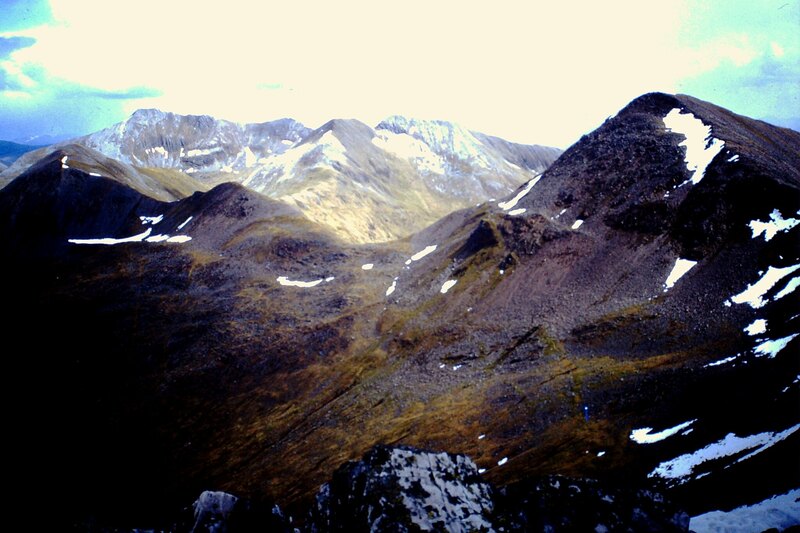 below the An Garbhanach / Stob Coire a'Chairn col, and Binnean Mor in the distance. The following day I got an early start, walking up through the Nevis Gorge and then up towards Aonach Beag's south-west ridge. 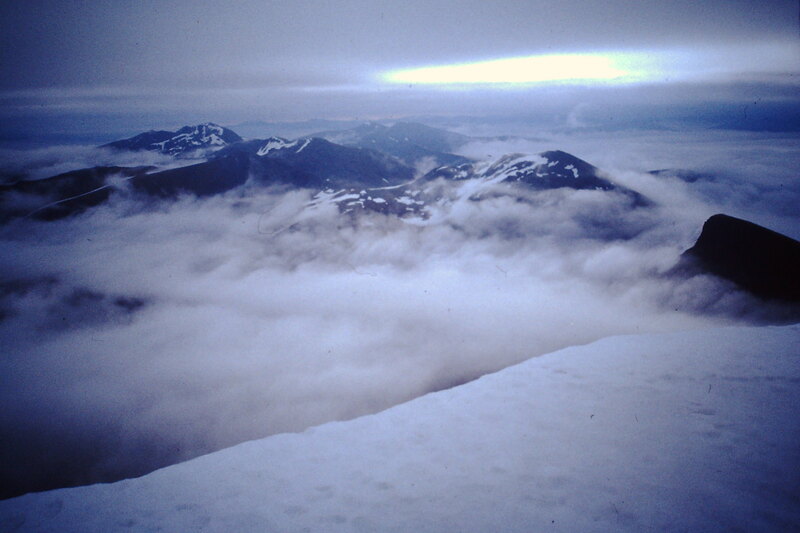 There was one break in the clouds giving me a glimpse of Ben Nevis. After that I was in thick mist, as dense I have ever known in the hills. Visibility was so bad that at one point I - and a large stag - nearby bumped into each other! 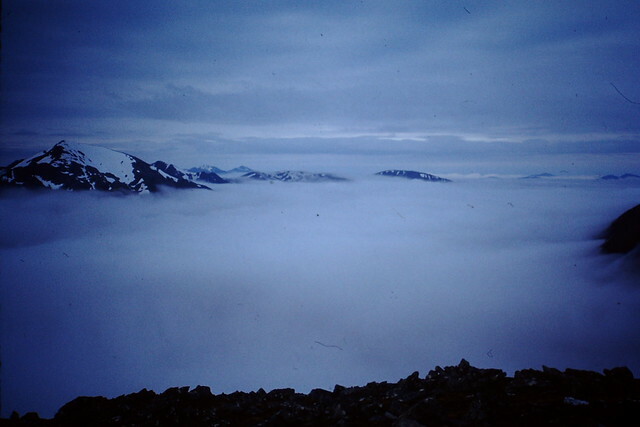 I navigated carefully over lumpy pathless terrain to reach the south-east ridge of Aonach Beag, then followed the ridge upwards - until I suddenly came out of the clouds! 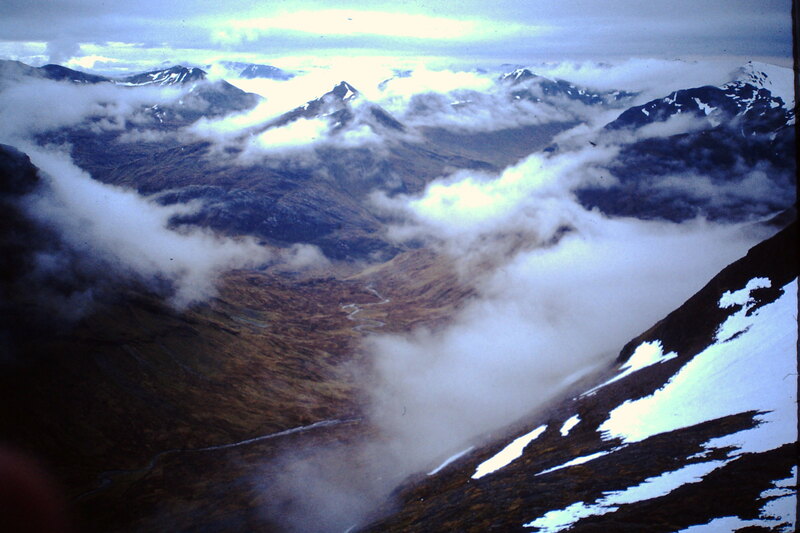 Hills like islands poking out of the clouds - from left to right Sgurr a'Mhaim, Stob Ban, the two Munro tops of Beinn a'Bheithir and the undulating flattened tops of Mullach nan Coirean. 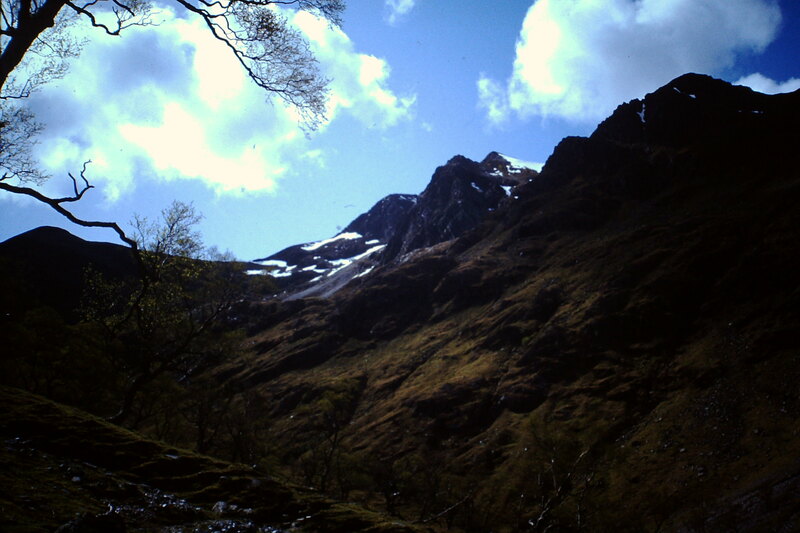 Upper Glen Nevis - from left to right the descending slope of Sgurr Eilde Mor, then Binnean Mor and Na Gruagaichean, with the Blackmount summits in the distance above the col. On the right of the shot is An Gearanach / An Garbhanach / Stob Coire a'Chairn. It was good to be able to see the bealach and the ridge that I planned to use for getting to the top of Carn Mor Dearg. 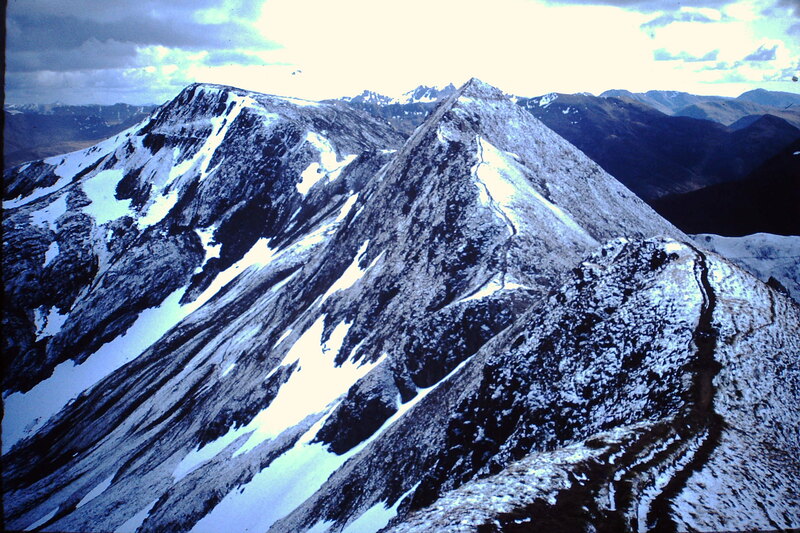 The central part of the Mamores, with the Glencoe hills forming the skyline. 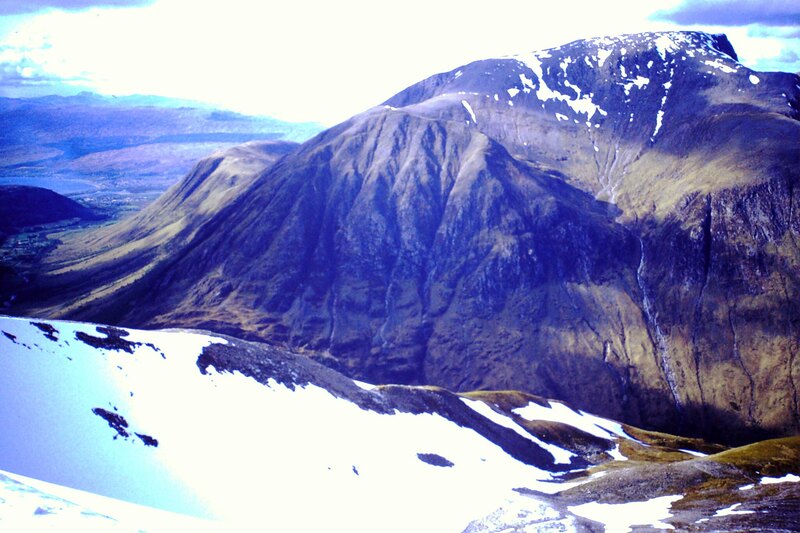 But perhaps my favourite shot was this view of Binnean Mor and Na Gruagaichean with a foreground of mini-crevasses. But immediately after I took that last shot, thick for once again wrapped round me. 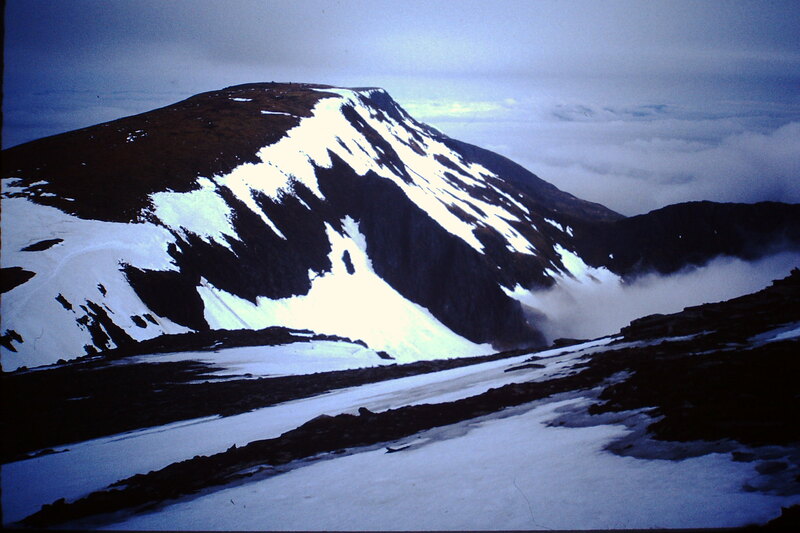 I crossed the plateau to reach Aonach Mor's summit, then back south across the plateau, navigating carefully to find the little blunt ridge shown on the map dropping down to the 830m bealach at the head of Coire Giubhsachan. 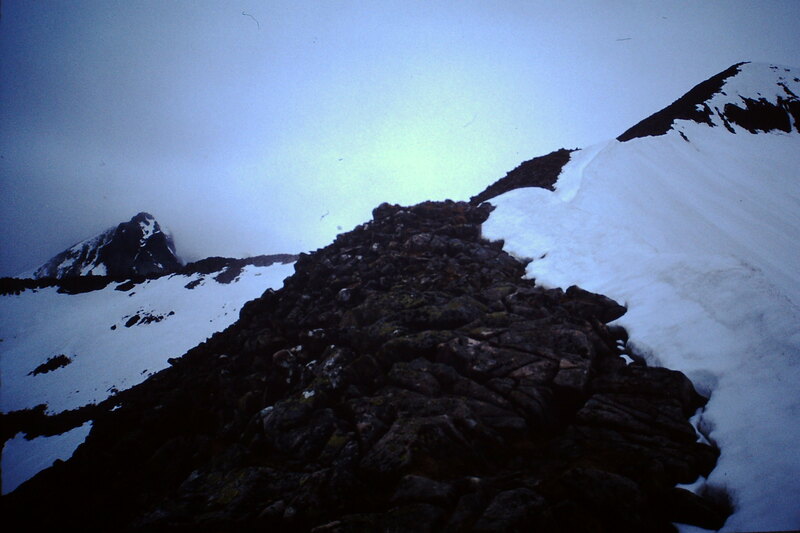 As soon I started descending this ridge, I found traces of a path - it is I guess such an obvious route for anyone who either wants to cross over towards Ben Nevis, or to descend the Aonachs to Glen Nevis. I was very soon at the bealach, still in thick mist. 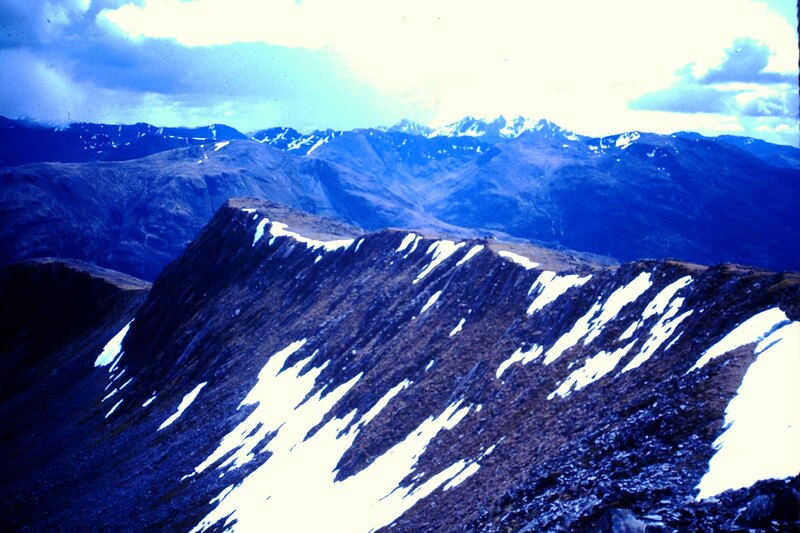 The ridge on the other side of the bealach had some steeper spots where I was glad of my ice axe. But it was all very straightforward. Again there was a sudden change in the weather and for the second time the fog rolled back. 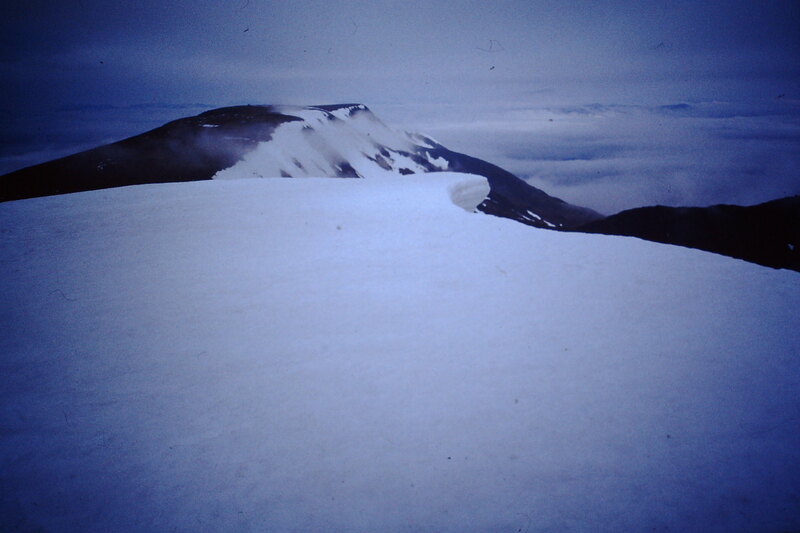 I could see the ridge ahead of me - and a glimpse of Ben Nevis on the left. 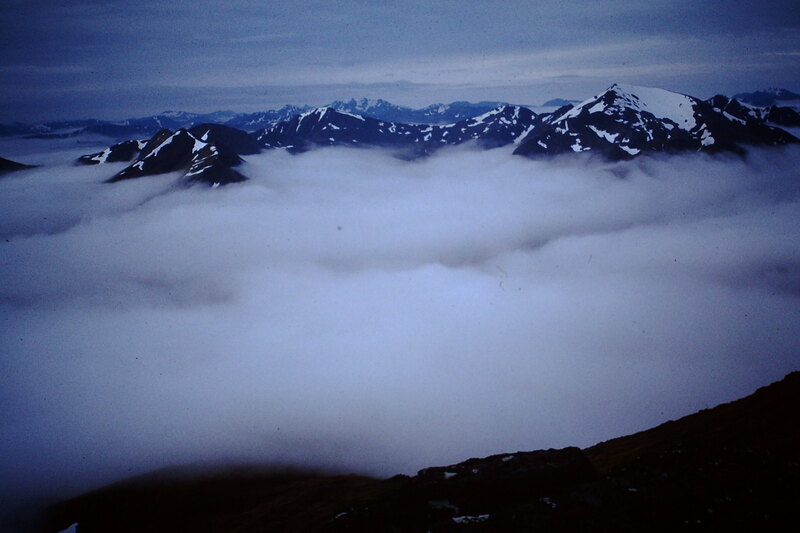 I had a fantastic view of the clouds all breaking up over upper Glen Nevis. 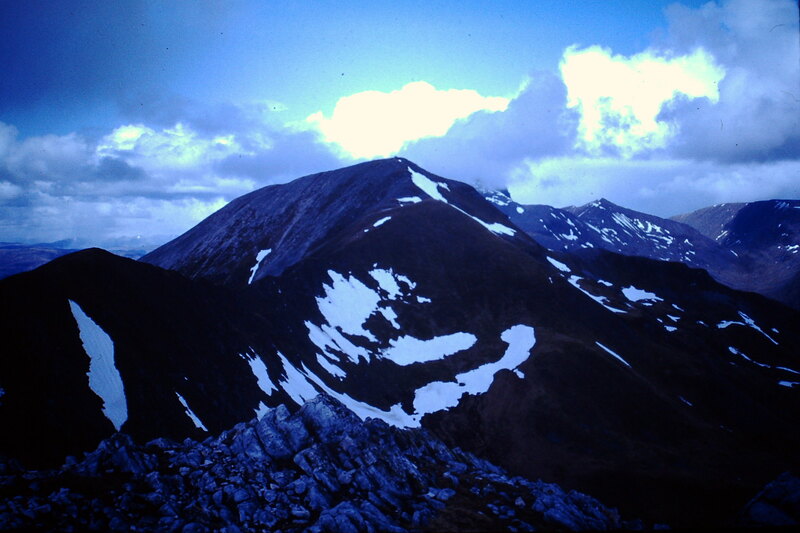 An Gearanach is the pointy peak in the centre. Note the thumb in the lower left corner, my signature photographic style. 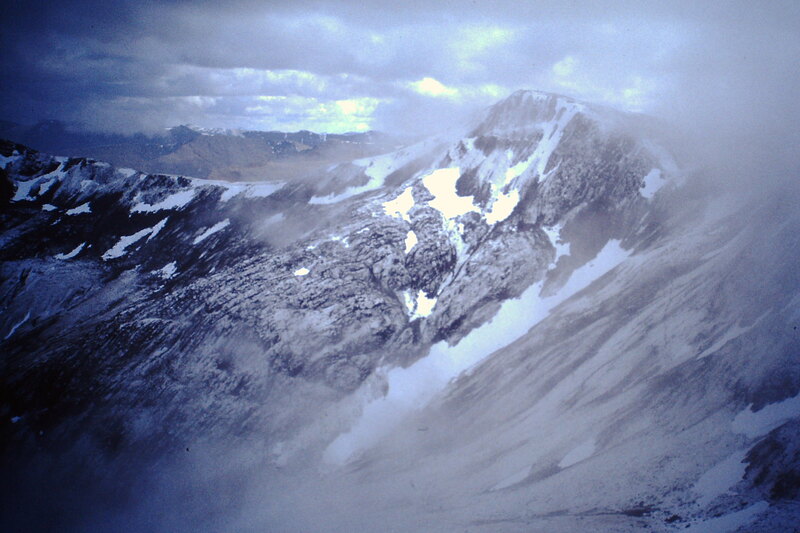 Nearing the top of Carn Mor Dearg's east ridge - the summit on the left, and Carn Dearg Meadhonach on the right. Views from the top of Carn Mor Dearg were extraordinary. Here's the Carn Dearg cliffs rising up out of the clouds. It was good to be able to spot the line of a scramble route I have done which I think is called the Ledge Route - up a gully to the prominent snow ledge, then rightwards to the top of the buttress and along a very nice arete to join onto the main mountain at the Carn Dearg 1214m cairn. 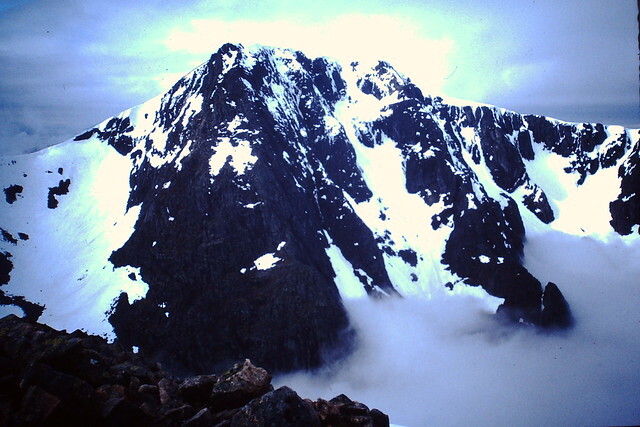 And Ben Nevis itself, with of course the North-East Buttress and Tower Ridge stealing the show. And then it all disappeared into the mist again! Never mind, I really enjoyed the Arete, what a brilliant easy scramble. One day I'll do it again and see the views! It was also good to reach the top of Ben Nevis - but then there was the job of getting back down to the car park. The descent was actually pretty straightforward but steep. I bombed along, as I wanted to get back to Port Appin in time for me and my wife to have the afternoon together. 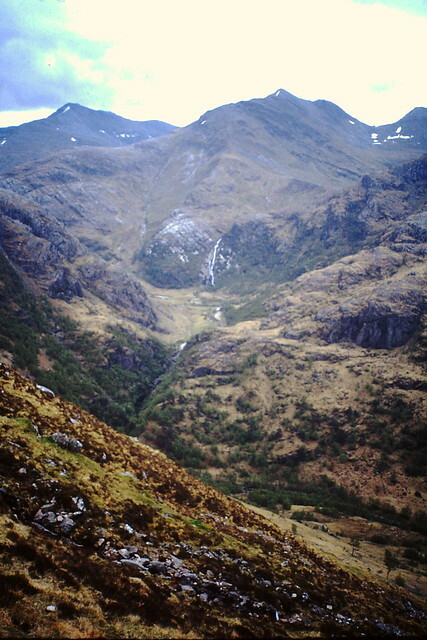 After a while I came out of the clouds and had a good view across Glen Nevis to Steall Falls. After that, it was more steep descent, following the "waterslide" down the last 2000ft or so of descent. 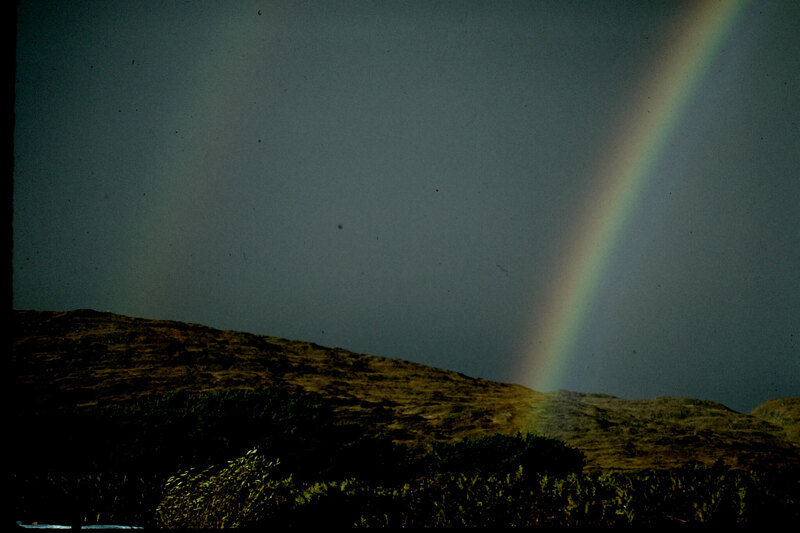 I was back in Port Appin by 2pm, and that afternoon we saw a great rainbow, a nice ending to two great days' walking. Brilliant! I love the old photos. Alteknacker wrote: Brilliant! I love the old photos. I thought of keeping quiet about the thumb, to see if anyone might think that my thumb was an undiscovered new Munro. Best to own up though. I blame it on over-excitement, at suddenly seeing a view again! great report, love the old photos!